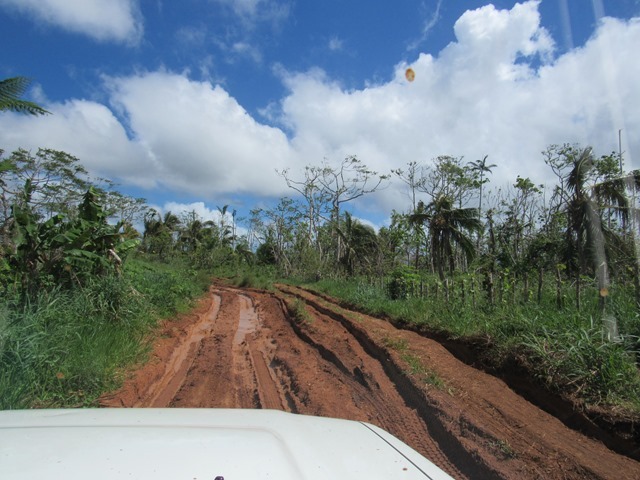 Since Cyclone Pam struck in mid-March, I have found myself going to the end of so many roads. Roads I never really paid attention to. Roads I never thought went anywhere. These roads have taken me to hundreds of people I never knew existed, living in small settlements tucked away in the hills, all within an hour of Port Vila. On Sunday, we were able to go to the end of yet another road and visit the people of Rangorango. 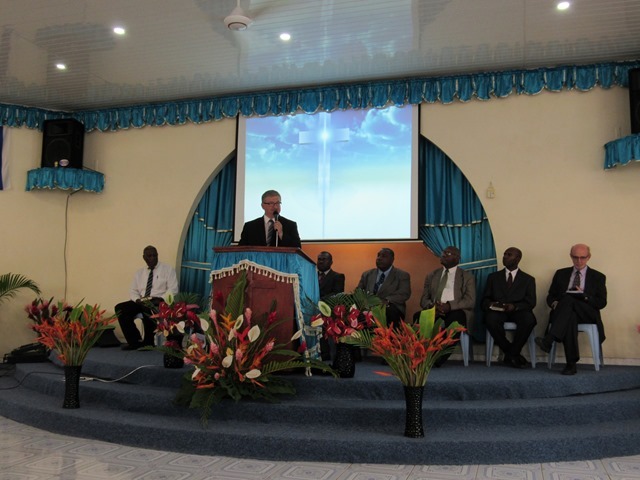 Pastor Charley Job (JBI grad) has supported this new church plant and wanted us to see it. He sent a 4 wheel drive vehicle to pick us up as the road is not very good. 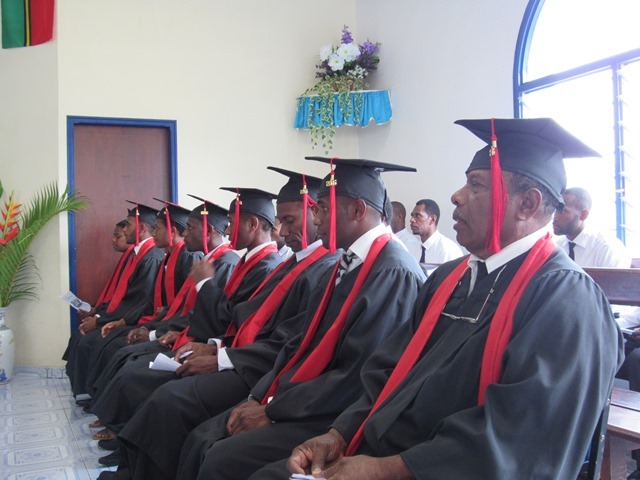 The pastor of the Rangorango church, is a 2013 JBI graduate, Pastor David Willie. The people living in these hills are from his home island of Tanna and the majority of them are truly unreached. It sounded like a short drive, “just follow the road to the end of the airport runway and go up the hill.” But to get to the Rangorango church, you keep driving up and over many high hills and sliding through some muddy low areas. When you are almost at end of the road, you turn off into the tall grass and keep going until you get to a big tree. We parked there and walked down a path. Sitting high on the side of a hill is a clearing with a large shelter covered in various colors of plastic sheeting and a small house, this is the Assemblies of God church. It was so wonderful to see Pastor David and within minutes, people started appearing from different directions until the church was full. 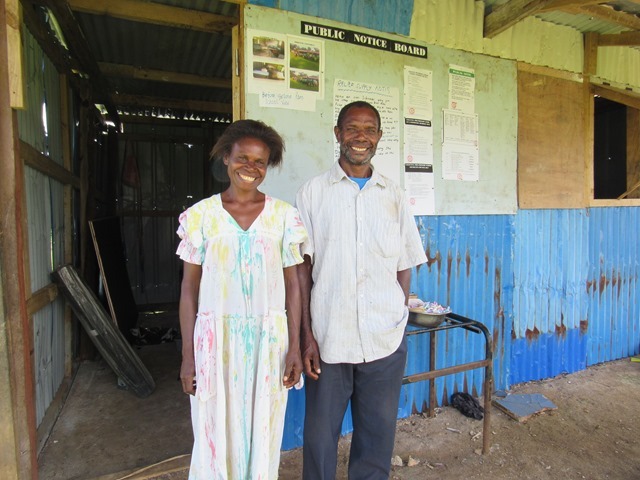 The church shelter had recently been rebuilt along with a small one-room house for the pastor and his family. Everything had blown away in the cyclone and recovery has been slow. 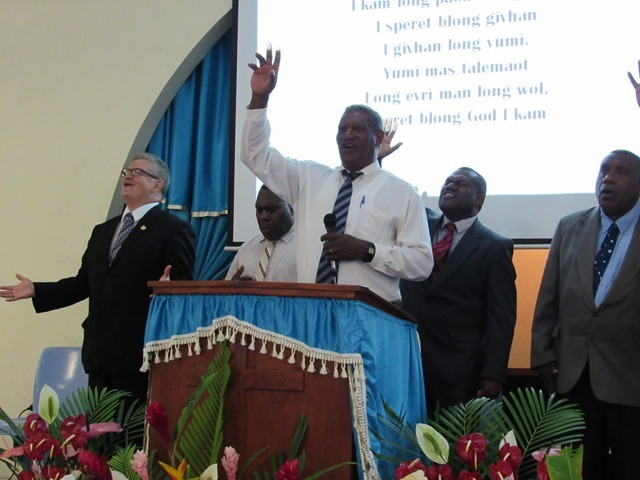 Gary had already preached on the radio that morning at 8 a.m. but he was happy to preach again. We had a wonderful service and several came forward for prayer. After service, I was asked to make an address on the importance of education, a first for me. Pastor Charley Job is very concerned because there is not a school anywhere in these hills. The children either have to be sent to live with relatives elsewhere to attend school or they stay home and miss out. The families connected to this small church alone have at least 50 children amongst them. The community needs at least a kindergarten. Pastor Charley has started schools elsewhere and wanted me to encourage them to start a kindergarten. After a lovely lunch, we headed back to town. Later the community had a meeting and it was decided to start a kindergarten at the church in 2016. This will be a wonderful way for the church to reach out to all the children in this area. They will build a one room schoolhouse and look within their community for a teacher. Pastor Charley and the Green Hill Primary School will help them organize and we want to help them with some basic furniture and school supplies. Will you help us provide some basic school supplies for the children of Rangorango? I was so impressed when I visited the primary school at Teouma Green Hill on the 22nd of April 2015. 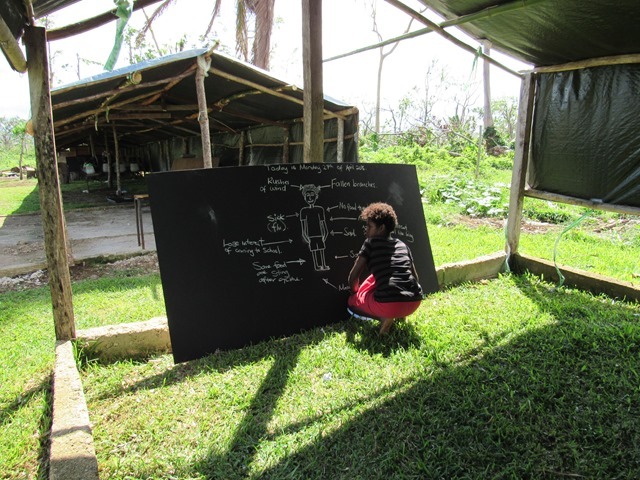 It had only been a few weeks since Cyclone Pam had devastated the southern half of the country. 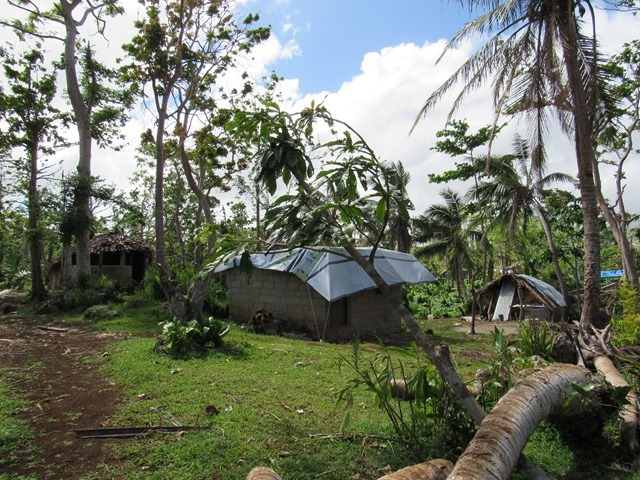 The upper Teouma farming community had been destroyed by the category 5 cyclone. The Green Hill School, started by Pastor Charley Job, had lost every building, most of their furniture, and books to the violent winds. But the headmaster had rallied his teachers and the community and by April 22nd they were back in class. This was truly a remarkable sight as teachers propped their blackboards on the ground and students huddled together on the grass to do their lessons. 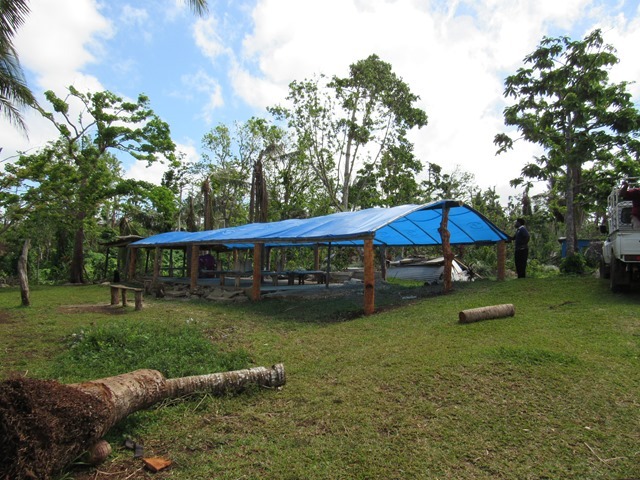 A hodgepodge of donated plastic tarps provided a roof over each class. It was an amazing effort to move on after an unprecedented disaster and I knew that others would want to assist and encourage such resilience. 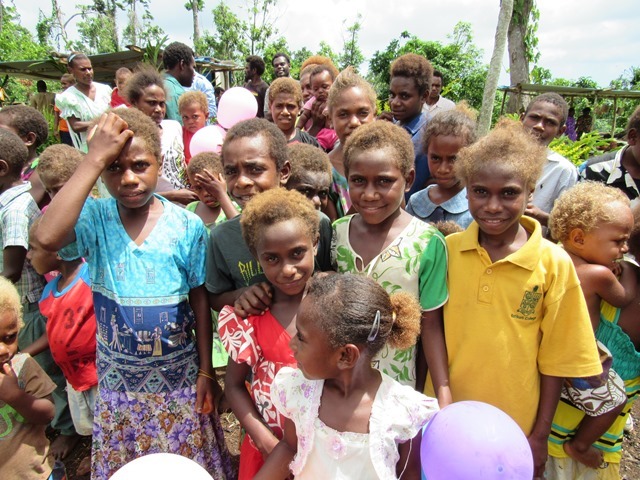 The first commitment to finance a new class building for these children came from the Australian Christian Churches International Relief (ACCIR) and I am forever grateful to them for their partnership and trust. A building plan for a simple 3 classroom building was drawn up and paperwork signed. Once the funds were in hand, the process of purchasing the materials and getting them up the 4WD bush road began. The delivery process took much longer than expected. Most local businesses did not want to send their delivery trucks off road. A big thank you to MCI for being the only coral and sand distributor willing to deliver all the way to the school site. Wilco Hardware and Bluescope Roofing also graciously delivered. But for the remaining tons of materials, cement, wood, rebar, and eventually water, local pick-up truck drivers had to be hired to make the deliveries. 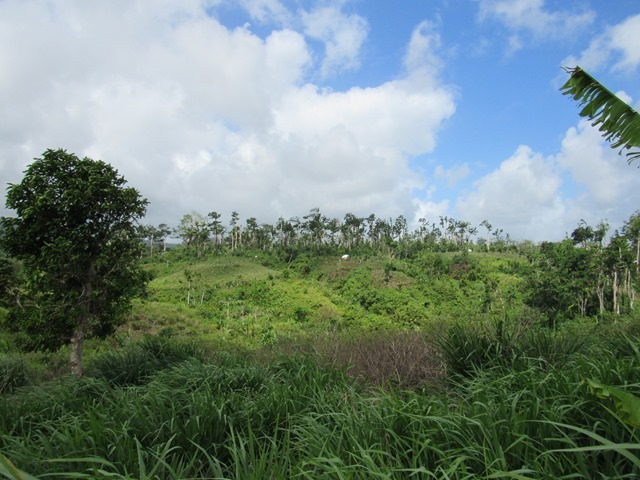 A couple of months after Cyclone Pam, Vanuatu was hit by an ElNino drought and all rain ceased. 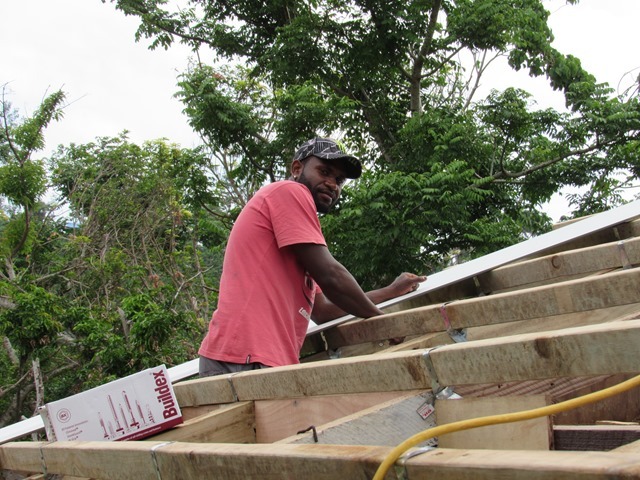 Most people in Vanuatu are not connected to a water supply but rather depend on catching rainwater. The prolonged drought greatly improved the delivery conditions of the road to Teouma which most of the time is a slippery, rutted four wheel drive mud road. On the hand, the drought has prevented the market gardening community of Teouma from regaining its normal cash income and caused great hardship. Crops were replanted promptly post-cyclone but the harvest has been meager. On November 23, 2015, reconstruction officially started on the Green Hill Primary school. 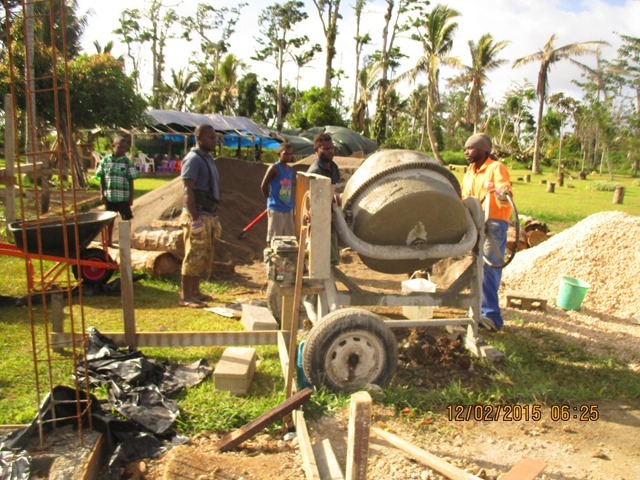 The community had fundraised to purchase tools, buy fuel for the generator to run the cement mixer, and host temporary construction workers. Everyone had been stocking water in tanks and containers to use in the pouring of the cement floor. The water on hand ran out half way through pouring the cement slab. Again the community rallied by filling water containers at a nearby lake and bringing it to the worksite. The workmen continued to mix cement as the people brought water. 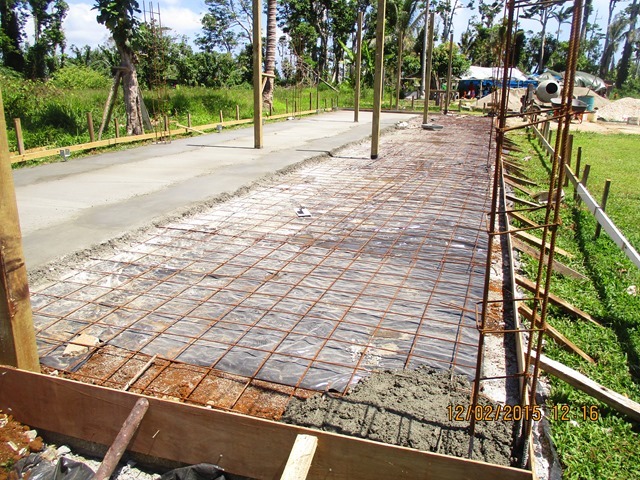 The cement slab was finished this past week. The rest of the building is a wood construction so there will be less need of water. If you would like to assist the rebuilding of the Green Hill Primary School, we are currently needing funds to buy school desks and chairs. 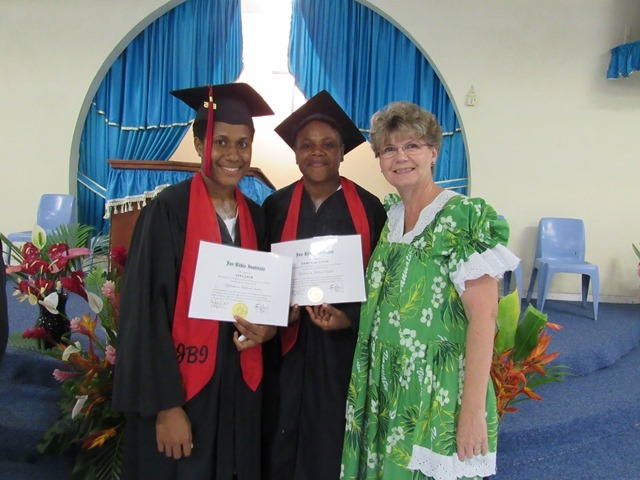 A second classroom building will also be started in early 2016 and about $40,000 US is needed. For months we have had ongoing problems with our internet service. We changed internet providers and then went back to our original provider. There is an overall technology problem in the city and it is beyond our control at this point. We hope that the system will improve in 2016. In the meantime, our email capabilities have been reduced to sometimes one brief connection per day. Internet browsing has become a rare event and loading a photo to our blog or even FB basically impossible. There is so much that has been happening and we are so anxious to share it with you. We apologize for the lack of update on our website. For months we have had ongoing problems with our internet service. We changed internet providers and then went back to our original provider. There is an overall technology problem in the city and it is beyond our control at this point. We hope that the system will improve in 2016. In the meantime, our email capabilities have been reduced to sometimes one brief connection per day. Internet browsing has become a rare event and loading a photo to our blog or even FB basically impossible. There is so much that has been happening and we are so anxious to share it with you. 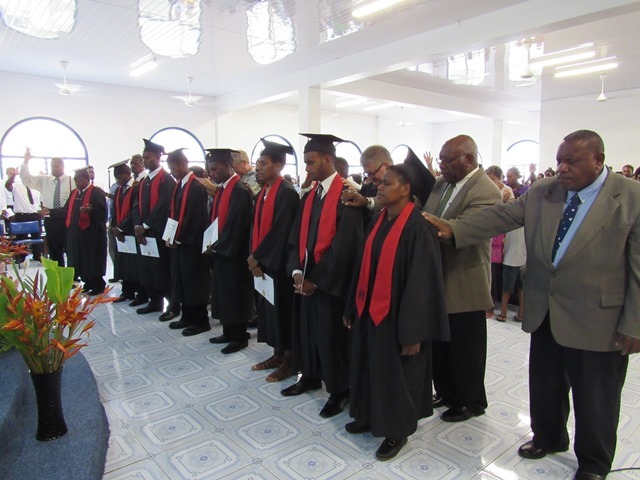 On Sunday, November 22rd, the Joy Bible Institute 2015 graduation service was held at Evangel Temple. 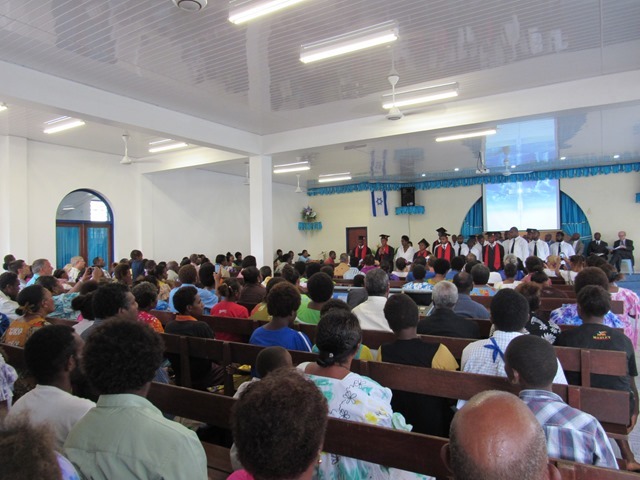 The church had been severely damaged by Cyclone Pam and was undergoing renovations right up until the night before. The pastor, church members and building contractor worked very hard to complete the inside sanctuary in time for our graduation. 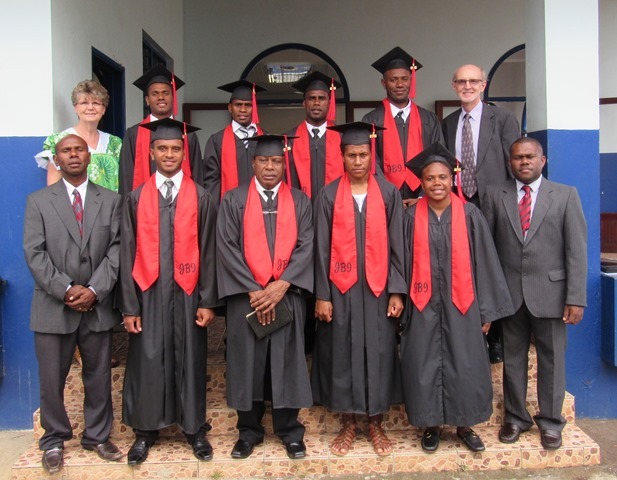 Eight wonderful men and women made up the 2015 graduating class. 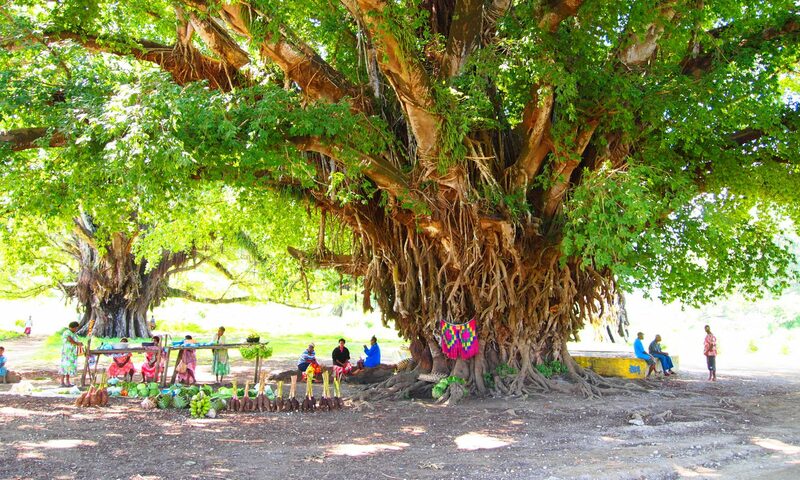 They are from five different islands in Vanuatu. John Nampas from Santo was the class speaker. Rev. 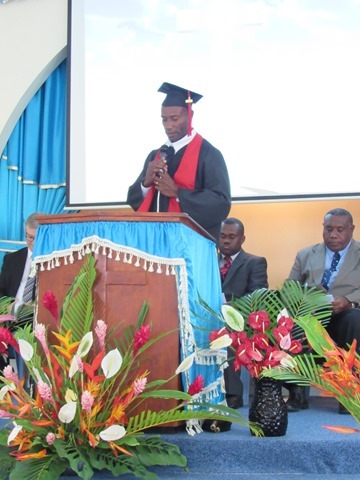 Dave Wood, newly arrived PAOC missionary from Canada and new pastor of the English-speaking International Church which meets at JBI was the graduation speaker. We had a wonderful service. The church was packed with hundreds of friends and family members. And at the end of the afternoon, while the graduates were still in the receiving line, it began to rain! After months of drought, we have been praying for rain so we all soaked it up! 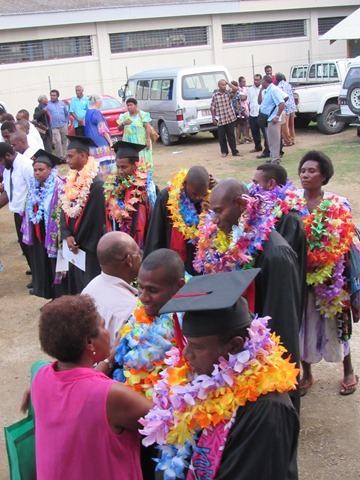 Please pray for our JBI graduates as they return to their home islands that they will be mightily used and please continue to pray for more rain to end our current drought in Vanuatu. A few miles out of town, you turn off the main road and head up a track made only for 4wheel drive vehicles to get to Green Hill, Upper Teouma. The road is deeply rutted, flooded, muddy, and a challenge to the best of drivers! The trip takes about 45 minutes if you do not get bogged down along the way. 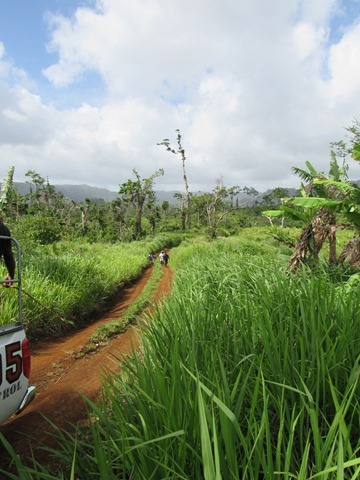 Until Cyclone Pam, I confess I had never been there, I was always told that our car could not make it. (It most definitely would not!) I knew there were several Assemblies of God churches in the upper hills of Teouma and would see the pastors and their wives at various gatherings in town. In April, the newly formed National AG Disaster Committee, hired a Landcruiser and driver and headed out for a damage assessment trip to Teouma. We had already done assessments of easier to reach churches and communities. A month after the cyclone, the long grasses had grown but the trees were still mostly stripped of leaves, branches broken, and many completely uprooted. Teouma is a market gardening community, nestled high in the hills. The cyclone whipped over these high plateaus ferociously, ripping crops out of the ground and blowing away every building in some settlements. It was a sobering drive. Our first stop was to Pastor Charley Job in Green Hill. Every building in their area blew away except his small cement block house. Their house had safely sheltered all the nearest neighbors during the storm. 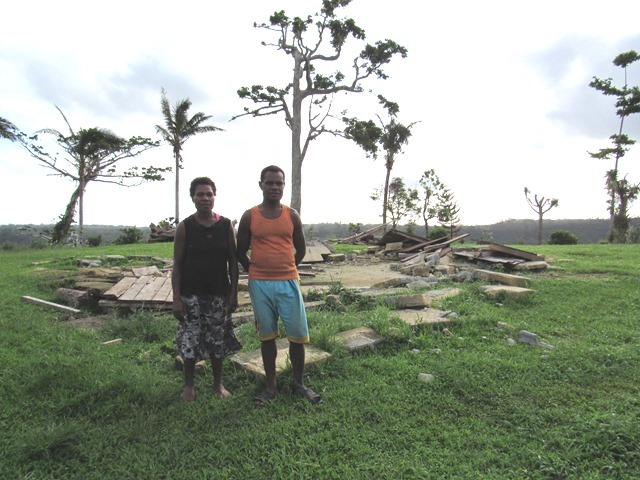 After the cyclone, they stepped out of their house to find their primary school gone, the church building gone, and the nearby church’s widows house also gone. The winds were so violent that almost nothing of the school was found within walking distance. They recovered only enough to rebuild a shed to store relief and donated school supplies in. Green Hill Primary School had just reopened for classes the morning of our visit. Not all the children were back in school but the principal and teachers were doing their best under teach. 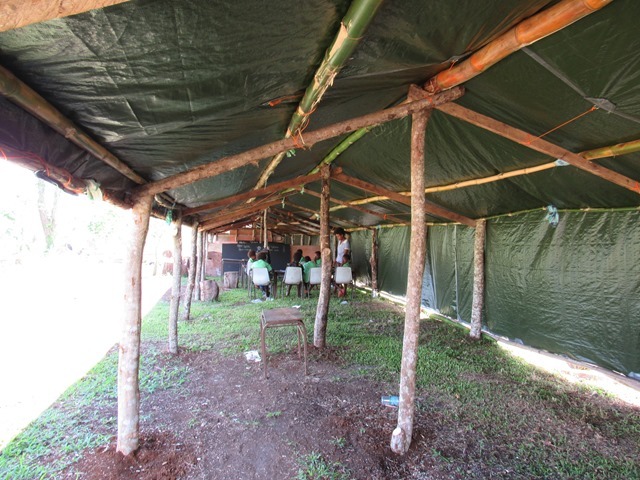 Salvaged wood and donated plastic tarps were the new classrooms. 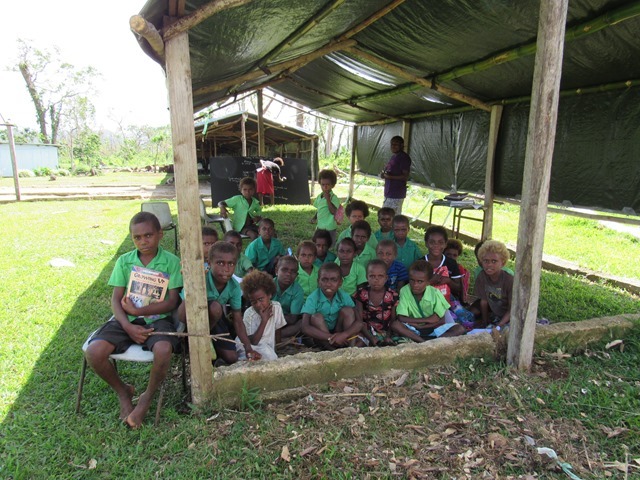 Children sat mostly on the grass, as very few desks and chairs survived the cyclone. Normally 120 children attended this school. I can tell you that I promised them that day to write letters and find someone to help them rebuild. Many damaged schools in town had not even begun to reopen when this school, which had lost everything, was back in session. From Green Hill we came back down to visit Pastor and Mrs. John Yalsi of Red Ground, Teouma. Their farming settlement is perched high on a cliff overlooking the Teouma River Valley. It is a beautiful spot but was completely devastated by the cyclone. Everything was destroyed including their church. Even the cement walls crumbled. The church members climbed down the high cliff to recuperate metal roofing sheets and things for their houses. In the photo above, the pastor and his wife are standing in front of the ruins of their church. 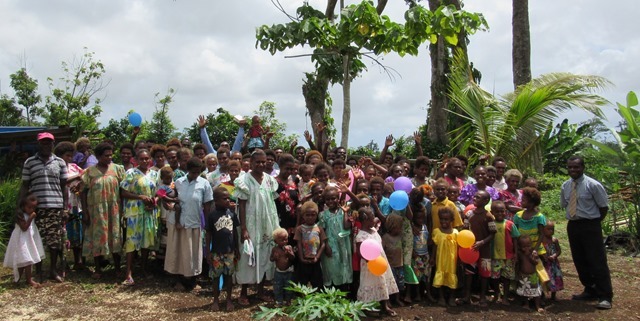 When we stopped to see them, they were busy in their gardens replanting crops to take to market in Port Vila. Until they had crops to sell, they would have no income. After a short visit, some words of encouragement and gifts of rice and meat, we continued on down the hill towards another Teouma church pastored by Pastor John Yalu. 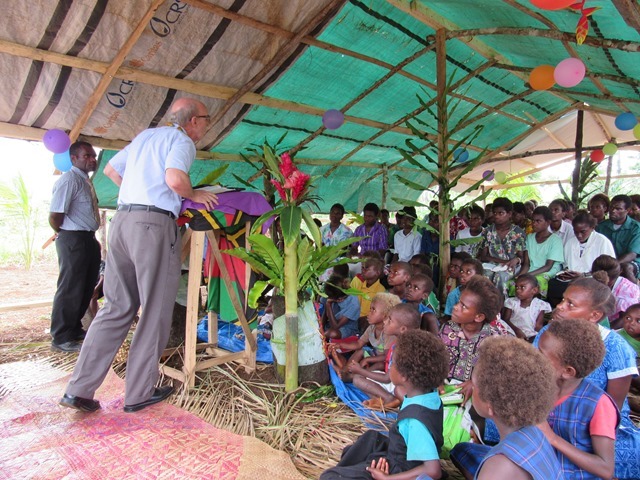 Pastor Yalu and his congregation, had used fallen coconut trees, bamboo, and blue plastic tarps to make the nicest temporary church I had seen. He was concerned that day because his wife had been away during the cyclone and was coming home to a house without a roof (photo on the right). We gathered with some of the church members and heard how God had protected them. Again after leaving some food, we continued on our way to visit other pastor and other destroyed church buildings. 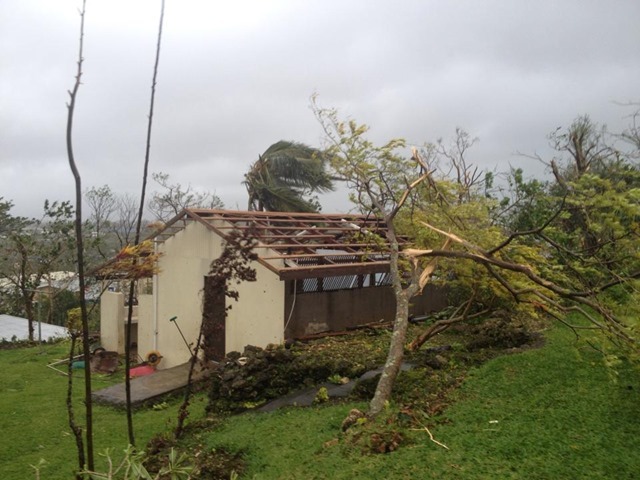 The Assemblies of God had 30 church buildings completely destroyed and another 20 severely damaged by Cyclone Pam. Many pastors and their members lost their homes and their incomes. 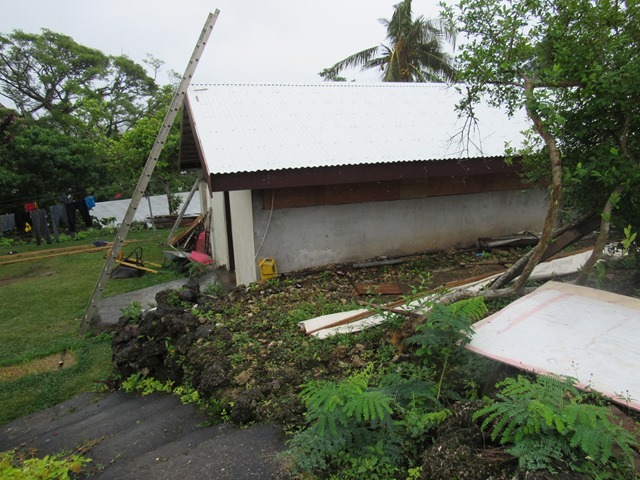 Thank you for praying and giving to help us rebuild churches in Vanuatu destroyed by this cyclone. If you haven’t yet given, we need your help. Please send all gifts to our AGWM account and label them for cyclone rebuilding. 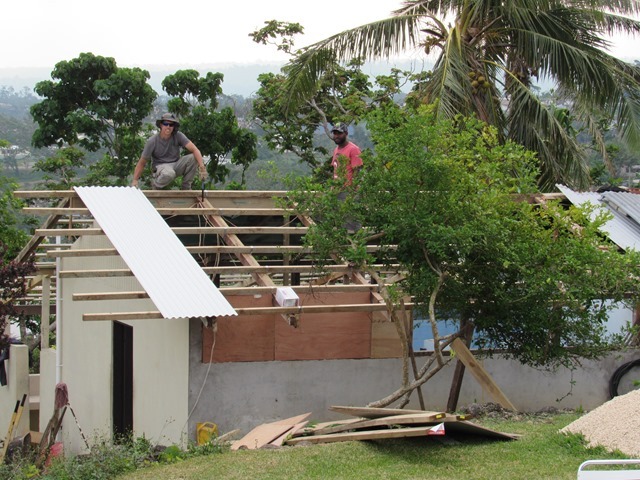 Cyclone Pam took the roof off this building which houses the boy’s bathrooms, their laundry, and the school workshop. Colton and Karmen worked really hard to get the roof back on to give everyone some privacy. The plumbing and electrical wiring still needs to be fully repaired but we have come along way in a few months. Thank you to everyone who gave to help us get this building repaired!